Disney is at its best when it abandons pretense. Every great Disney animated film has that moment when the wheels come a bit loose. A big burst of creative energy threatens to derail the whole production with its absurdity. Aladdin’s go-for-broke moment is “Friend Like Me,” the musical sequence where Genie introduces himself to Aladdin in the Cave of Wonders. In Capcom’s 1993 Disney’s Aladdin for the SNES, this moment comes to life in a video game, and in one level in particular. The game developers at Capcom had their work cut out for them. How would they go about translating this sort of boundless fun into a video game adaptation? One option was to not even try. Other video game adaptations of Disney animated films barely adhered to their source material. In The Little Mermaid (NES), Capcom completely reimagined the end of the film. Ariel turns herself back into a mermaid (who even knew that was possible?) and wages a one-woman war against Ursula. But Aladdin (SNES) is an almost complete adherence to the film’s plot. Even when the game took creative license, it never diverged from its source material’s spirit. 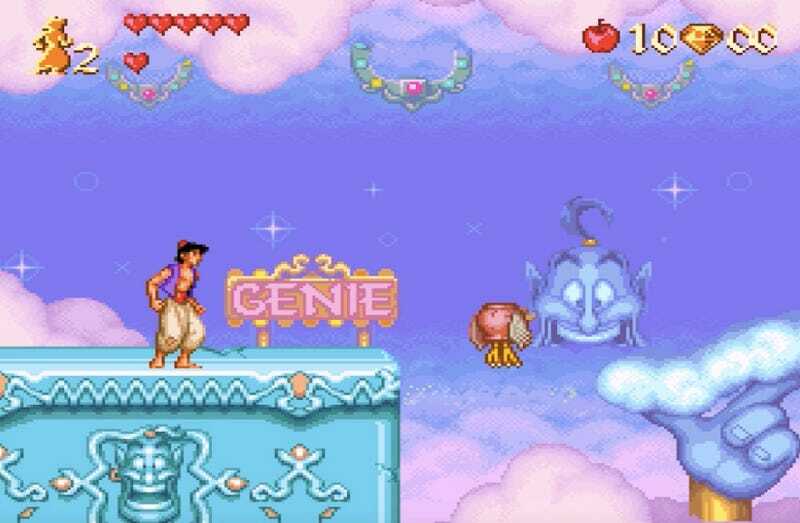 In the Genie level midway through the game, Genie invites Aladdin into his lamp to have a look around. That doesn’t literally happen in the film, but the level roughly corresponds to the film’s “Friend Like Me” sequence, and in fact even uses the song as background music. Through its design and visual callbacks, it does an excellent job of capturing that freewheeling tone. The Genie level is an exercise in contrast. It juxtaposes with the prior level, during which you attempt to escape from the Cave of Wonders. For first half of the Cave of Wonders, Aladdin jumps over lava lakes, balances on shaky rock platforms, and dodges large fireballs. For the second half, he rides his Magic Carpet while being chased by a massive wave of lava. Both halves of the level scroll to the right, which means that the player relies on reflexes instead of carefully-laid plans. So when the game follows this red and orange hellscape with the Genie level, it’s a relief. Suddenly, everything is cool blues and white, fluffy clouds. The visual symbolism is clear: water extinguishes fire. It’s a soothing salve on a burn wound. In the film as well, we get a brief respite from the lava when Aladdin and Abu are trapped in the Cave of Wonders. The subsequent “Friend Like Me” sequence, which occurs after Aladdin rubs the lamp for the first time, shifts the mood from one of despair to one of relief and happiness. Once a powerless street rat, Aladdin is now the most powerful man in the world; he has a genie at his disposal. And the game’s corresponding Genie level alludes to this giddiness by having Aladdin literally walk on air. There are three sections to the level, each of which has its own distinctive visual theme. The first section is the aforementioned clouds and blue sky, which features basic platforming. The trickiest part of this section is the midway point. Genie swoops in, wearing a magician’s costume, to conjure up clouds, playing cards, and balloons Aladin can use to traverse a massive gap. If you miss your jump and fall, Genie gives you a comical look of horror and shock. The Genie-fied objects have the same exaggerated concern and shock written all over their faces. It lightens the mood, even as you’re falling into the abyss. The most memorable characteristic of Genie (and his voice actor, Robin Williams) is his variety. He effortlessly changes his physical appearance and mannerisms many times throughout the film, impersonating Groucho Marx, Joan Rivers, and Ed Sullivan, to name a few. The responsive objects in Aladdin (SNES) speak to that sort of malleability. Small touches create the illusion that the player is always being watched. Aside from the interactive objects, Genie’s face is even carved into the relief of the walls. The character has a pervasive, all-encompassing presence, and it’s an accurate reflection of the Disney company’s ethos. If you go to Disneyland, for example, you’ll notice that depending on which area of the park you’re currently in, the theming is immersive and consistent. In Frontierland, the benches and chairs are wooden. The signage appears hand-drawn. At night, the area is lit by lanterns. You hear roots and bluegrass music constantly, even in the bathrooms. Fans delight over this sort of thing— the sheer number of trivia books speaks for itself—and the Genie level in Aladdin (SNES) has the same sort of obsessiveness that characterizes Disney’s best work. Were Disney to construct a “Genie’s Lamp” area in their theme parks, it’s difficult to imagine it looking much different from what is in the game. The second section of the Genie level is airier and features mini-tornadoes and large balloons that you can swing from. These challenges require precision jumping, sometimes from one balloon to the next, without the stability of stationary platforms. The third section features a vertical ascent. You have to traverse a series of Genie tongues and Genie-themed springs to reach higher ground. In “Friend Like Me,” there is a similar fluidity to the Genie’s creations. Solid ground is liquid the next moment. Materialized objects suddenly disappear. Despite occurring at the game’s midpoint, the Genie level is one of the easier parts of the game, especially compared to the prior Cave of Wonders. Most games are sequentially difficult, adding new wrinkles and complications after each challenge. But Aladdin’s developers knew the power of pacing—increasing and decreasing the difficulty in ebbs and flows—to create a more dynamic experience. The developers followed the Genie level with a Pyramid level, which again ratchets up the difficulty. After that is the Magic Carpet bonus level, in which it’s impossible to die. Only then did you take on Jafar’s castle. This also parallels the structure of Disney’s animated films, which balances carefree innocence and peril side-by-side, and juxtaposes them against one another. Disney has all but given up on licensing AAA video games for its animated films. Zootopia, which broke box office records, has no companion video game, even though its storyline lends itself to it. Frozen has a single 3DS game called Olaf’s Quest and a free, downloadable, match-three snowball fight game, both of which are lazy, patronizing substitutes for more substantive experiences. Should Disney ever prioritize its video game adaptations again (they really should), Aladdin’s Genie level would be an excellent, reliable blueprint for successfully capturing that intangible “Disney magic” through visual cues and careful attention to detail. Kevin is an English teacher and freelance writer from Queens, NY. You can email him at kevinjameswong@gmail.com, and follow him on Twitter.